NHL News : Breaking: Flyers make urgent call up following last night's devastating injury! Breaking: Flyers make urgent call up following last night's devastating injury! Veteran goalie Brian Elliott, who has been arguably the Philadelphia Flyers' best player during the past few weeks, left Thursday's 3-0 loss at the hands of the New Jersey Devils after suffering an injury trying to stop Kyle Palmieri's wraparound goal at the end of the third period. You can see how the injury took place in the video above, atop of this article. Elliott made a quick movement, going from post-to-post in an attempt to make the stop and appeared to injure his groin. 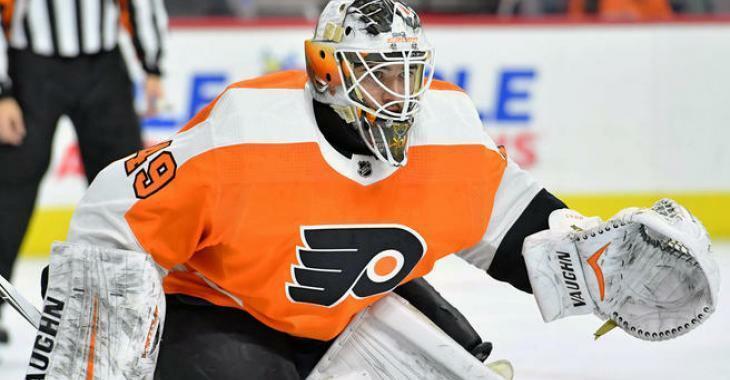 on Friday, the team announced that they have recalled Alex Lyon from the American Hockey League's Lehigh Valley Phantoms. Lyon was recalled earlier in the season due to an injury in net, but he didn’t play in any games. He could end up having to play some now, especially if Elliott is out long-term. If Elliott is sidelined for a long time, it could also mean bad news for his backup, Calvin Pickard. He has played well recently, but he took a 4.42 goals-against average and .865 save percentage into his relief appearance Thursday. He has appeared in just 94 NHL games. Elliott had core-muscle surgery in February and hip surgery in the off-season, and his latest injury may be related. He would be the second goaltender of the club on the sidelines with an injury as Michal Neuvirth is still injured. UPDATE: Elliott will miss approximately two weeks with a lower-body injury.